The day Malaysian Airlines flight MH17 fell to Earth in pieces, everyone in our world was told Russia and Vladimir Putin murdered the 298 people aboard. It is over a month since the biggest ‘shoot-down’ incident in air passenger history, and this is what we know for sure. Whatever happened in the skies above eastern Ukraine on July 17, we’ve been set on a reactionary course charted by either fools or the adjunct henchmen of some unseen game. Did we risk the outbreak of World War III over hearsay and rumor? A mouthy leadership in the West has revealed the only real truth of this matter: credibility and trust was ‘blown out of the sky’ over Ukraine. At 1:15pm in the afternoon on July 17, 2014, the air traffic controllers at Kiev lost radar and voice contact with flight MH17. The Boeing 777-200ER, flying from Schiphol Airport in Amsterdam to Kuala Lumpur, fell in pieces on Ukraine's eastern frontier. The earliest reports the public received on the catastrophe came from the various mainstream media. Those outlets basically parroted what officials in Kiev and the US State Department released. From the outset, officials in the West started a blame game, and one of massive proportions. Within a few hours of the event, nearly all media reflected assurances that Russia, and the pro-Russian fighters in eastern Ukraine were guilty. 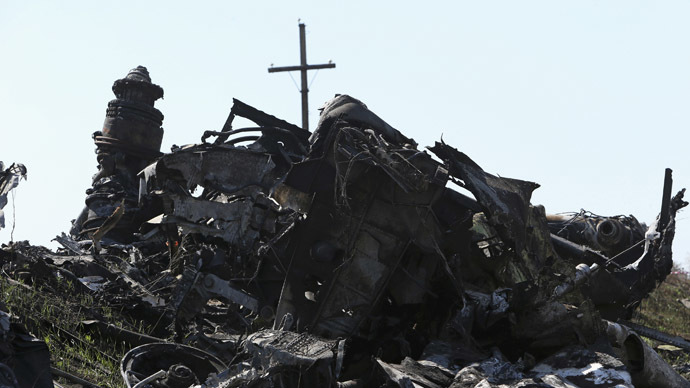 We know now that almost all the initial information on the Malaysian Airlines downing was misleading at best. We were expected to believe Russia’s president ordered his military to drive a BUK system across Russia’s border, to deliver it to separatist forces there in order to shoot down a friendly aircraft, and then to drive the launcher back into Mother Russia. Moreover, this was all to be accomplished secretly, and in broad daylight through the most hotly-contested real estate in Europe. Western leadership and once-trusted media asked the world to be complete idiots, hapless peons ready for a Ukrainian ‘shock and awe’ campaign. But today we have a dozen plausible theories of what happened. The most legitimate at the moment, an air-to-air engagement by Ukrainian SU 25 attack aircraft, has been largely ignored even though key experts abide by the theory. The Kiev/US/NATO/GCHQ/EU/White House narrative has quieted down somewhat now, since Russia’s Defense Ministry sent the message that it had all the evidence. But we’re left with crippling counter-sanctions here in Europe. Sanctions levied on Russia based on a heap of lies, for all we know. Where I come from there’s a saying: ‘the squeaky wheel gets the grease’. It’s a good saying because it’s true. Well, the ‘squeaky wheel’ in this tragedy reveals more malicious intent than we’ve seen since the two great world wars. Almost instantaneously the most powerful and vociferous US politicians leaped into action. Major media from CNN and Fox to Reuters and the BBC followed suit, as if scripted. US Secretary of State, John Kerry, for one, now appears as a ‘hothead’ or irresponsible over early claims of ‘knowing’ in a dire international incident. It’s interesting to note that Kerry has now faded into the background, left professing other truths about Gaza, Iraq and a resurgent need to strike in Syria. Moments after MH17 went down, Kerry’s State Department announced America’s ‘horror’ over the loss. Then, just over four hours after the fact, Vice-President Joe Biden proclaimed MH17 had been “blown out of the sky” over “pro-Russia-controlled” east Ukraine. Reuters tweeted Biden’s headline not five hours extant, provoking the question: How did Joe Biden know so soon? #BREAKING: U.S. Vice President Biden says Malaysia Airlines jet was shot down, "not an accident, blown out of the sky"
Then presidential hopeful and former Secretary of State Hillary Clinton entered the fray, hot on the trail of truth, no doubt. Clinton appeared on the Charlie Rose Show the evening of the 17th to discuss MH17, pointing at Russia and observing stock prices. Any reasonable person might ask ‘How was it even possible to discuss the event so soon?’ and ‘Why was Clinton so focused on the stock ticker?’ The pieces of the Malaysian airliner, the bodies of the victims, had not even stopped smoldering. Clinton pounded out the obvious concept that “the equipment used had to have come from Russia.” She further illustrates her total disdain of public understanding. Any American child having been indoctrinated to know, Ukraine was once part of the USSR back in school. Where else would their weaponry come from? Then we saw America’s favorite State Department punching bag, Jen Psaki, come on two days later to assure us further that the administration was appalled by the insurgents who speak Russian “limiting access” to the crash site. All this after OSCE monitors had begun investigating right after the disaster. And all this misinformation at a moment when the Kiev junta had simultaneously launched a massive offensive right on top of the investigation zone? The media mirrored this, without even so much as an annotation that the separatists were being surrounded and bombarded relentlessly from the west. To add insult to injury, John Kerry spoke with CBS Face the Nation, and other major TV media the Sunday after MH17 crashed. Again Russia was culpable. Headlines from Kerry’s MH17 campaign had the Secretary of State of the United States of America claiming “Enormous amounts of evidence” to show. But we’ve never seen any of it. The New York Times, CNN and the mighty BBC were not the only media pounding out a message on their war drums in late July. Even a former tech-blog-turned-world-events tabloid spiked the punch for the Millennial Generation with ‘Rebels Load MH17 Victims'Bodies Onto Train Cars, Destination Unknown’. Destination unknown? Really? As if Putin himself wanted to bury the bodies in Irkutsk. It is significant to note here, one of the editors of the Kyiv Post contributes information and editorial to Mashable, the world’s most-read social media outlet. But perhaps that’s just another coincidence in this most recent high tide of ‘coincidental’ truth. What’s more important for the public now are the results we are feeling because of MH17’s downing, and the subsequent blame game. To wit, the greater catastrophe we have been led into. Just a few days after those poor passengers on flight MH17 perished, Washington sounded a bugle charge to the European Union to impose severe economic sanctions on Russia over that country’s involvement. Even though ‘involvement’ had yet to be proven. Soon afterward, Brussels complied with America’s bidding. Russia and Putin, at long last, responded in kind. Putin countered by banning agricultural products from Europe. Now farmers and other businesses across the EU face almost certain ruin, the protests and cries for help, having already begun. What’s even more potentially disastrous (especially for the US) is the probability the EU will come to its senses and retract the sanctions. When this happens, the Germany-US bond may well be broken, the likely replacement being Russia. Insinuations of aggression by Russians, this has been the dogma of the Western leadership since before the Sochi Olympics. Vladimir Putin, considering the vehemence with which every Russian construct has been attacked this last year, has been unbelievably calm. The West attacks Sochi and the Olympics - Putin puts on fantastic games. The McCains and Kerrys of America incite riots in Maidan Square - Putin watches and informs. The Russian language is brought down in Ukraine - Russian speakers beg for help. Then Russia takes back Crimea in a bloodless annexation – Washington and NATO use it, just like MH17, for another propaganda extravaganza. Today the headlines for MH17 read ‘Briton killed when flight MH17 shot down over Ukraine identified’ or ‘Remains of Irish MH17 victim formally identified’, along with stories about Malaysian Airlines restructuring. Barack Obama, David Cameron, Australia’s Tony Abbott and the rest of those so sure for their right, now they've gone completely silent. Their theories and professions have literally disappeared, leaving us all either to accept their judgmental evangelisms at the start, or to forget about the perpetrators of the 21st century’s most dangerous political catastrophe so far? How is this even possible? We have nationalized all the poor victims, boxed and shipped off all the bodies, while the souls of those killed linger aloft somewhere, killed by unknown assailants. If transparency does not happen very soon, our belief in justice and truth will be the ultimate victim. Can we live down a travesty? Somewhere in Spain today, a farmer sits pondering the eternal, the dilemma each of us has wrestled with at one time or another, ‘What am I going to do?’ More appropriately though, what is the EU to do? We’ve no need to regurgitate economic catastrophes from Portugal, Greece, Italy, Ireland, or to tell you about Romanian austerity horror stories here. German Chancellor Angela Merkel and other EU leadership are reeling at this moment to steady a staggered confederation of nations. Spanish farmers burning EU flags over harvested peach crops, the imagery of that pretty much says it all. Sanctions levied on to a massive consumer nation like Russia, for no concrete reason, shows either a vast incompetency in the West, or an absolutely resolute posture toward conflict and chaos. We are witnessing one of the biggest travesties of foreign policy ever perpetrated on Earth. While some may argue I am being sensationalistic here, consider Hillary Clinton on TV minutes after a mass murder blaming Russia for the crime. More than this, think of why she was consulting the stock ticker during her frenzied look to understand the tragedy, before anyone could have known what took MH17 out! Logic demands we ask: ‘Or did they know?’ I mean, did the American administration ‘really know’ who killed all those people? Days later we saw inside Russia’s equivalent of ‘the war room’, evidence to the contrary presented by a professional soldier. But somehow the report you see below in the video was not presented as a counterpoint, but as a propaganda piece by BBC, Reuters, and the others in the West. Now we experience a humanitarian convoy, held up by Kiev with vital food and medicine for Russian speakers in eastern Ukraine, widely reported as ‘an invasion’ by Putin. We’re asked to believe again, in trumped-up allegations that the same Russia that rolled over the Blitzkrieg in World War II, the same Russia that made us ‘duck and cover’ in the 1960s, the same Russia that struck fear into all Europe during the Cold War, that those Russian armed forces need to sneak into Ukraine in first aid trucks. Excuse me, but this is something a lunatic would utter. Just like some lunatics cried ‘Russian wolf’ when the streets of Sochi were running over with wolves and gay haters, the second most-powerful military in the history of Earth has to ‘sneak past’ a broken Ukraine junta’s forces? Like me, the reader should be laughing and crying at the prospect. For me, judging Putin in all this brings me to one inextricable conclusion. I wonder what the world expects from a great leader. I wonder what my fellow Americans envision a Russian politician needs to do to represent his or her people. Is Ukraine not at least as ‘Russian’ as it is anything else? And if parts of Ukraine are indeed Russian, what kind of man would leave his people to starve? To be slaughtered? What kind of Russia would stand by and watch NATO stick ballistic missiles 250 miles from Moscow? Since we’ve more questions than answers since MH17 went down in a fireball, maybe the ultimate inquiry is introspective. What kind of America supports lies and kills or destroys the lives of millions of people? The gravity of that question should compel us to demand the answers. Not tomorrow, but today. My fellow Americans would not cheat the world. Phil Butler is journalist and editor, and a partner at the digital marketing firm, Pamil Visions PR. Phil contributes to the Huffington Post, The Epoch Times, Japan Today, and many others. He's also a policy and public relations analyst for Russia Today, as well as other international media. You can find Phil's blog at http://www.phillip-butler.com.